So, miscellaneous Monday is not more, Monday is just a really bad day for me to try and sit down and blog. So, we are going to try Tuesday’s Tidbits instead…LOL! 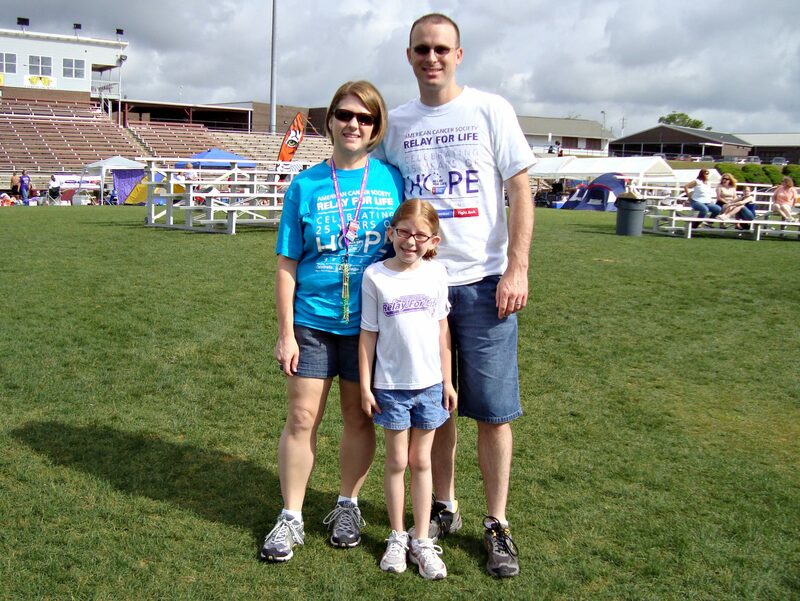 Relay for Life was this past weekend and a huge success. The Niceville and Valparaiso communities raised more than $116,000 and we had 188 survivors present. I walked a lot less than last year, only 14 laps, but performing committee duties took a good portion of my time. I’m not sure how many laps Bryan got in, but Jacey did 23 and was bummed she didn’t get to do more. We had planned to stay all night this year, but the pull of our house only being 1.5 miles away from the track proved to be too much. We went home for a few hours but ended up being onsite 13 of the 18 hours. Now we get a few months break until the committee meetings and 2010 planning starts up again. Bryan even wants to be involved in the steering committee for 2010. I read this verse earlier in the week and I really wish I could live by it. Wouldn’t life be so much simpler with that fram of mind?! So, I *think* we finally got summer sorted out (to an extent anyway). Looks like we will be in Texas for a week in June, with Jacey staying an additional 3 weeks between 2 sets of grandparents. I’m really not looking forward to the drive, but I am looking forward to a bit of a break, some real Mexican food AND a Texas cheesesteak from Texadelphia. YUM!! May must be “make parents broke” month. Jacey’s keeps coming home with field trip forms left and right this month. So far on the schedule is seeing Disney Earth and her gifted class is going to the Gulf Coast Exploreum in Mobile. The one in Mobile, Bryan and I are both chaperoning…pray for our sanity! Bryan is all packed up and ready to head out tomorrow to Savannah for a TDY. Lucky duck, one place I have always wanted to go (yes, so I can go see the Tybee Island Lighthouse and eat at Lady & Sons). It is a short one but I was still going to try to head over for a long weekend but just can’t get it to work out with all of Jacey’s end of the year testing and such…sigh. Next place on the agenda is Holloman AFB, New Mexico again later in the year and that is NOT a place I care to visit…LOL! You need to go check this guy out, Wayne Hall. He played at Relay For Life and was awesome. I could have sat there and listened to him for hours. It’s only him and his guitar, but that is all he needs. Tonight my flickr account is urgently urging me to renew my pro membership, my membership expires in 5 days…gasp! LOL! I just don’t know if it is worth it anymore though. I have had a pro account for 3 or 4 years now, but just really don;t use flickr much anymore. I use my web space, my blog and facebook primarily…we shall see. Can you believe, I have had a webpage for 12 years now?! Wow! If you’d like to see where it all started (and thank goodness, it didn’t stay that way) take a peek. My original webpage was http://www.angelfire.com/la/firstlady/. Call me!! We could meet up for lunch at Texadelphia!!! Glad the Relay for Life was such a big success, I bet a lot of hard work went into it. I hate it when I see Phillip pull out the suitcases…mostly because I hate playing the role of a single parent. Took a look at the first web page…you’ve come a long way baby!